Replacement batteries for Sony NP-F 500 Series PLEASE NOTE: This product contains Lithium Ion Batteries. Due to FAA regulation this item is restricted to ground transportation in the lower 48 contiguous states and cannot ship to Alaska, Hawaii or Puerto Rico. Replacement batteries for Canon NB Series PLEASE NOTE: This product contains Lithium Ion Batteries. Due to FAA regulation this item is restricted to ground transportation in the lower 48 contiguous states and cannot ship to Alaska, Hawaii or Puerto Rico. Replacement batteries for Sony NP-F 700 Series PLEASE NOTE: This product contains Lithium Ion Batteries. Due to FAA regulation this item is restricted to ground transportation in the lower 48 contiguous states and cannot ship to Alaska, Hawaii or Puerto Rico. Replacement batteries for Sony NP-F 900 Series PLEASE NOTE: This product contains Lithium Ion Batteries. Due to FAA regulation this item is restricted to ground transportation in the lower 48 contiguous states and cannot ship to Alaska, Hawaii or Puerto Rico. Replacement batteries for Cannon models BP-915, BP-930 and BP-945 PLEASE NOTE: This product contains Lithium Ion Batteries. Due to FAA regulation this item is restricted to ground transportation in the lower 48 contiguous states and cannot ship to Alaska, Hawaii or Puerto Rico. Replacement batteries for Canon models BP-512/514, BP-522 and BP-535. 2 Year Warranty PLEASE NOTE: This product contains Lithium Ion Batteries. Due to FAA regulation this item is restricted to ground transportation in the lower 48 contiguous states and cannot ship to Alaska, Hawaii or Puerto Rico. Power2000 ACD693 Digital Video Lithium Ion (Li-ion) Battery, Replacement Battery for the Canon BP-2L12 7.4V 1500mAh PLEASE NOTE: This product contains Lithium Ion Batteries. Due to FAA regulation this item is restricted to ground transportation in the lower 48 contiguous states and cannot ship to Alaska, Hawaii or Puerto Rico. 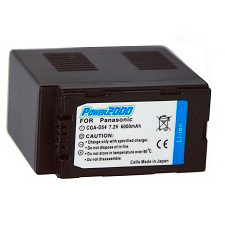 Power2000 CGA-DU21 Replacement Lithium-Ion 7.2v, 2400mAh Camcorder Battery for Panasonic CGA-DU21 PLEASE NOTE: This product contains Lithium Ion Batteries. Due to FAA regulation this item is restricted to ground transportation in the lower 48 contiguous states and cannot ship to Alaska, Hawaii or Puerto Rico. Replacement batteries for Sony NP-FM Series PLEASE NOTE: This product contains Lithium Ion Batteries. Due to FAA regulation this item is restricted to ground transportation in the lower 48 contiguous states and cannot ship to Alaska, Hawaii or Puerto Rico. 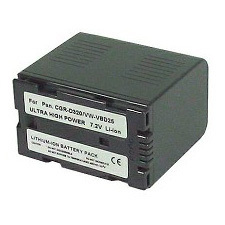 Power2000 ACD-709 Long-life Digital Video Lithium Ion (Li-ion) Battery, Replacement Battery for the Panasonic CGA-D54 PLEASE NOTE: This product contains Lithium Ion Batteries. Due to FAA regulation this item is restricted to ground transportation in the lower 48 contiguous states and cannot ship to Alaska, Hawaii or Puerto Rico.